I am interested in finding ways to balance human development and wildlife conservation goals. Currently, I am studying the dynamic of scavenger guilds in the Pyrenees (focusing primarily on vultures) and factors that can regulate populations. I hope to determine the key factors that affect the vulnerability and viability of populations, especially in relation to current anthropogenic threats such as poisoning, changes in European Union sanitary policies and habitat alterations. To identify the mechanisms involved in the habitat loss and the decline of threatened species I’m appliying new bio-inspired models (P-systems) in order to propose sound conservation schemes to restore the ecosystems and populations. MARGALIDA, A. & COLOMER, M.A. (2012) Modelling the effects of sanitary policies on European vulture conservation. Scientific Reports 2: 753. MARGALIDA, A. (2012) Baits, budget cuts: a deadly mix. Science 338: 192. MARGALIDA, A., CARRETE, M., SÁNCHEZ-ZAPATA, J.A. & DONÁZAR, J.A. (2012). Good news for European vultures. Science 335: 284. MARGALIDA, A., CAMPIÓN, D. & DONÁZAR, J.A. (2011). 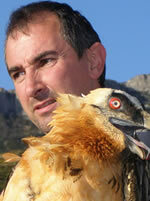 European vultures’ altered behaviour. Nature 480: 457. MARGALIDA, A., COLOMER, M.A. & SANUY, D. (2011). Can wild ungulate carcasses provide enough biomass to maintain avian scavenger populations? An empirical assessment using a bio-inspired computational model. PLoS ONE 6: e20248. MARGALIDA, A., MORENO-OPO, R., ARROYO, B.E. & ARREDONDO, A. (2011). Reconciling the conservation of an endangered species with an economically important anthropogenic activity: interactions between cork exploitation and the Cinereous Vulture Aegypius monachus in Spain. Animal Conservation 14: 167-174. MARGALIDA, A., DONÁZAR, J.A., CARRETE, M. & SÁNCHEZ-ZAPATA, J.A. (2010). Sanitary versus environmental policies: fitting together two pieces of the puzzle of European vulture conservation. Journal of Applied Ecology 47: 931-935. DONÁZAR, J.A., MARGALIDA, A., CARRETE, M. & SÁNCHEZ-ZAPATA, J.A. (2009). Too sanitary for vultures. Science 326: 664.